The best truffle recipe will yield a truffle that is meltingly creamy as well as intensely chocolate. The other flavors will compliment the chocolate, yet not take away from the smooth consistency of the candy. Bring the cream just to a boil in a heavy pan. Stir in chocolate until melted and smooth. Cover tightly and refrigerate overnight or at least six hours. Use an ice cold melon baller to create the round truffles. Keep refrigerated until 30 minutes before you are ready to serve. 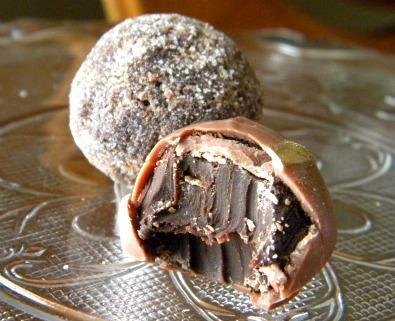 Once you have made the basic truffle recipe you will want to make variations. Here are some truffle recipes that are perfect for gift giving or treats anytime. Add two teaspoons of any of the following flavors or a combination of flavors to your basic truffle mixture. Another way to flavor the truffles is to infuse the cream with flavor before adding the chocolate. In order to do this you will add about a tablespoon of the flavoring ingredient to the simmering cream. Remove from the heat and allow to cool. Strain and then warm the cream up again and proceed with directions for adding the chocolate. Plan to store the finished truffles in the refrigerator and take them out about a half hour before serving. Make sure that they are tightly covered in an airtight container so that flavors from other foods in the refrigerator do not change the flavor of the chocolate. Truffles can easily be made ahead and will keep for a couple of weeks. Once you have perfected the best truffle recipe for your purposes, begin to experiment with other recipes, such as this recipe for chocolate cheesecake truffles, to see which gives you the ultimate combination of creaminess and chocolate flavor.